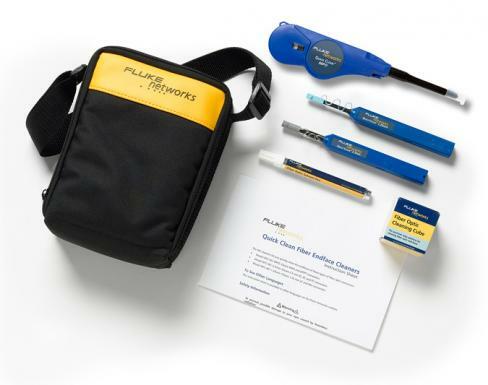 Fluke Networks’ Fiber Optic Cleaning Kits contains the best fiber optic cleaning tools and products to effectively remove the toughest contaminants in any fiber network. 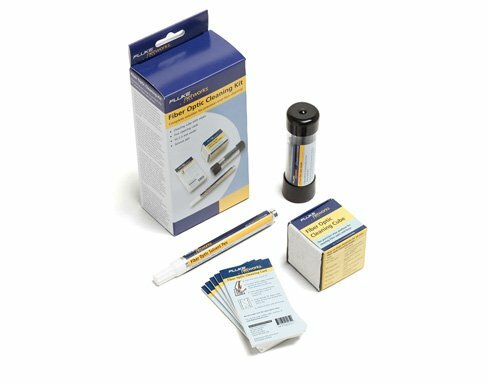 You can choose between the easy-to-use Quick Clean Cleaners, the convenient cleaning cube/card and the best optic solvent pen to clean both patch cords and fiber end faces inside ports. 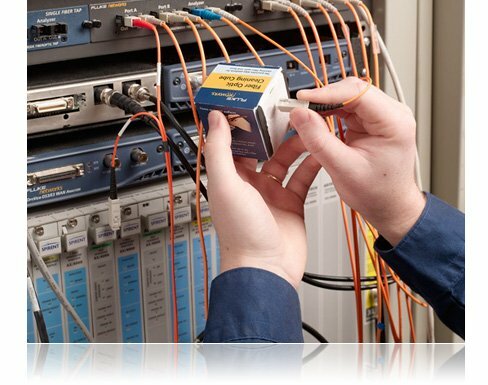 All fiber optic cleaning products and materials are lint-free and enable an optimal wet and dry cleaning process. Open or remove the guide cap from the Quick Clean Cleaner. Push the cleaner straight into the connector and you will a hear a click to confirm cleaning. Push the cleaner straight into the connector. Turn the dial until you hear a click to confirm cleaning. Remove the plastic cover from one cleaning zone. Apply a minimal spot of solvent to the starting corner of the cleaning zone. Holding the connector perpendicularly, swipe the end-face from the wet spot into a dry zone. Inspect again to ensure a complete cleaning. If necessary, expose a new cleaning zone and repeat steps again. Pull a clean wipe from the Cleaning Cube. Apply a minimal spot of solvent to the starting edge of the wipe. Inspect again to ensure a complete cleaning. If necessary, repeat the steps again on a new portion of the exposed wipe on the Cube. Apply a minimal spot of solvent to the wipe. Touch the swab to the wet spot on the wipe for 3 seconds to absorb a minimal amount of solvent. A damp swab works better than a wet one. Insert the swab into the port and turn several times while applying gentle pressure. Follow the damp swab with a dry one, using the same procedure to remove any remaining solvent from the end-face and alignment sleeve. * Note that applying solvent directly from the pen to a swab will result in excess solvent on the swab. Traditionally, dry cleaning has been proven to be only partially effective in eliminating contaminants from fiber end-faces and connectors. The challenge had been that the dry cleaning materials were either not good enough to uplift the various types of dirt or greasy contaminants, or they actually introduced static to the fiber ferrule that attracts dust. 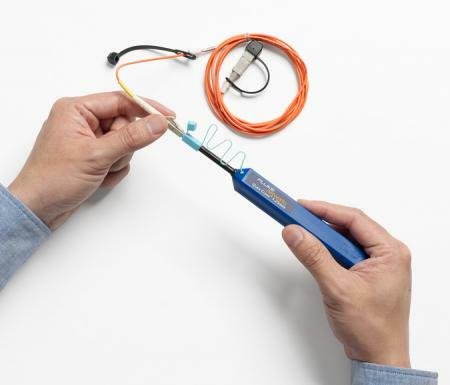 With technological advancement and better dry cleaning materials, however, a new class of fiber cleaning tools have been created to provide a cost effective and efficient solution for cleaning more than 50% of contaminants from optical networks. 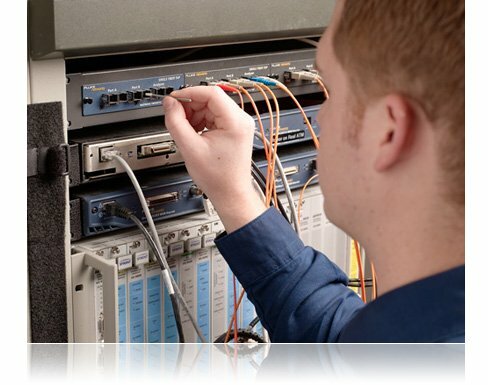 It is therefore very important to avoid using simple swabs or cleaning papers to perform dry cleaning on any fiber connectors. Instead, use Fluke Networks’ Quick Clean Cleaner to eliminate most of the dust and harmful particles in your fiber plant. Cleaning with only a pre-soaked wet wipe or excessive solvent will leave liquid behind on the end-face which also causes problems. As that excess solvent dries, it can leave behind of film of dissolved contaminants that were never properly removed. In addition, residual isopropyl alcohol (IPA) can leave behind a “halo” as it dries that not only causes attenuation, but also can be very hard to remove. No solvent should remain at the conclusion of a cleaning. Canned air and dusters are ineffective and should not be used to clean end-faces. The only thing dusters do is blow large particles around. On a patch cord, this may be effective, but inside a port this can result in those same particles settling elsewhere. Dusters are ineffective on smaller, statically-charged particles and totally useless on oil-based contaminants such as buffer gel or body oil. Last, dusters often expel a propellant that becomes a whole new contaminant that now requires an effective cleaning process to remove. Do not be lulled into thinking that end-faces on factory-terminated patch cords or pigtails will be clean when they are brand new and covered with a dust cap. Though dust caps are great at preventing damage to the end-face, the caps themselves can be a source of contamination. The plastic used to create dust caps will outgas a residue as its plasticizers deteriorate over time and the surface of the cap may contain mold-release substances used in their high-speed production process. Don’t be surprised to find a contaminated end-face upon removal of a protective cap. 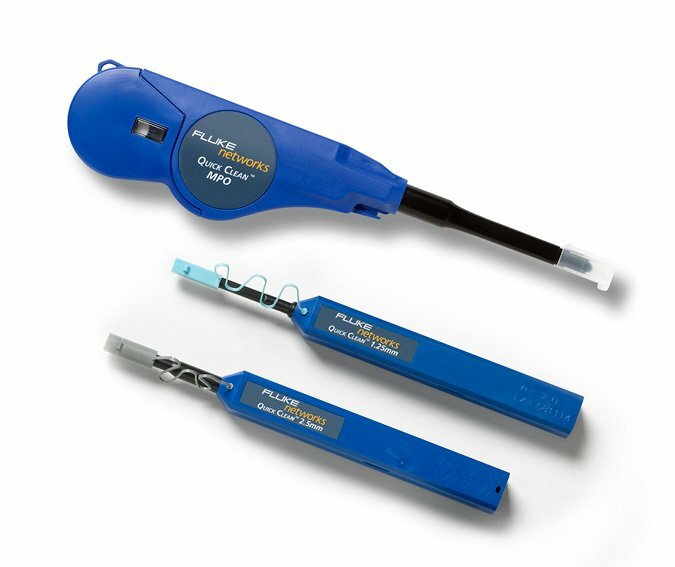 For repeatable and reliable end-face cleaning, always use Fluke Networks’ tools to follow the recommended wet and dry process. 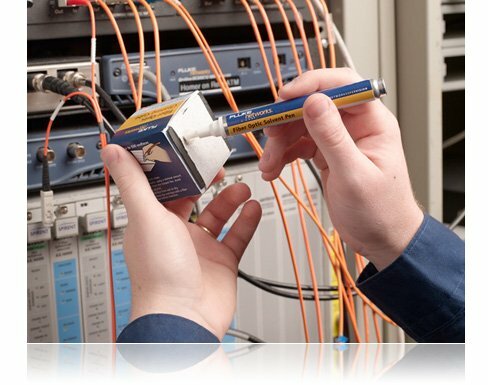 For years isopropyl alcohol (IPA) was used to clean fiber end-faces, but now there are customized solvents that are far superior, such as Fluke Networks’ Fiber Optic Solvent Pen. Most importantly, this specialized solvent is more effective than IPA at dissolving all contaminants, especially non-ionic compounds such as buffer gel and pulling lube. You will get a better clean every time and with every contaminant. Next, our solvent has a lower surface tension than IPA that allows it to envelop particles and debris, effectively lifting them from the surface of the end-face as they are carried away by a wipe or swab. Many smaller particles carry a charge that bonds them to the ferrule or an end-face. Unlike IPA, this solvent is oxygenated to neutralize this charge so that the charged particle can be removed and more particles are not attracted onto the end-face. When cleaning end-faces inside ports or equipment, the evaporation rate of solvents become significant as it is harder to guarantee removal of all solvent. Fluke Networks’ customized solvent has an evaporation rate tailored to stay long enough to work yet still disappear before mating. It evaporates much faster than IPA. IPA is highly hygroscopic and therefore draws water vapor that can then dry on the end-face and leave a residue, which sometimes appears as a “halo”. 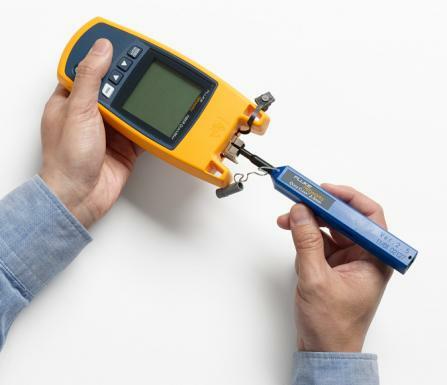 Using Fluke Networks’ solvent will avoid this problem. 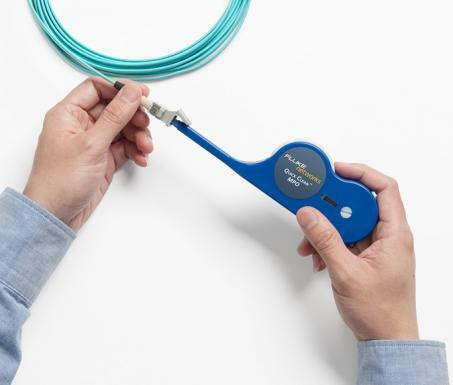 Fluke Networks' family of mechanical cleaning tools designed to clean fiber optic connector end faces on patch cables, within adapters or patch panels.